To Dog With Love: Box Games for Dogs: Go Hide! 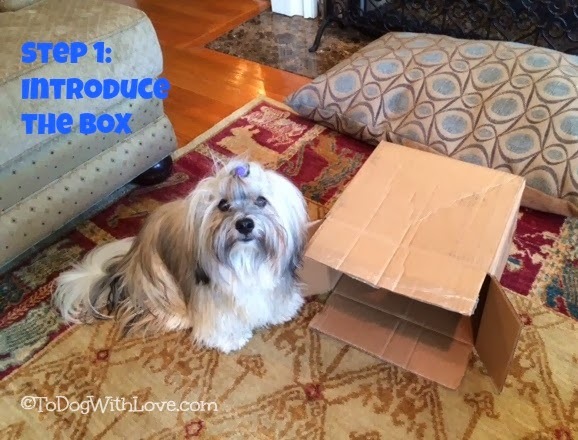 Box Games for Dogs: Go Hide! We're about halfway thought the winter session of K9 Kamp and we hope you're all having fun playing Doggie Hide and Seek! Last week we played the "Find It" version of Hide and Seek, and today we're going to show you our version of "Go Hide"! All you need to play Go Hide is a box, some treats and a dog. You can also use a clicker if that's your preferred method of marking behaviors. It can be useful to capture precise moments during the behavior rather than rewarding after a behavior has occured. Karen Pryor explains how to use a clicker to shape behavior with box games in 101 things to do with a box. We used this method to teach Rocco to Go Hide in a box! First Rocco was willing to offer all kinds of behaviors, as you can see here. He can be a creative doggy. 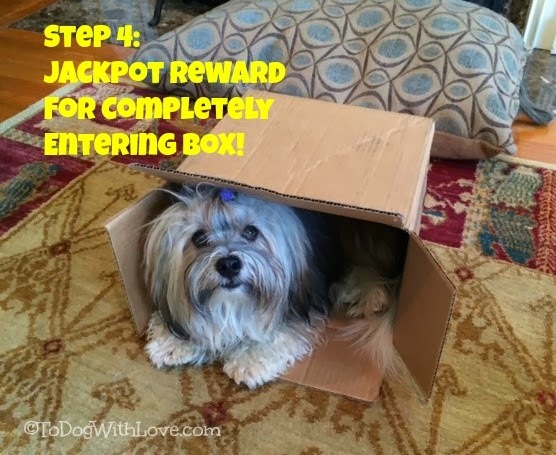 We've already rewarded all sorts of box interaction behaviors so we were ready to start rewarding just the behaviors that led toward Rocco entering the box. This process is called shaping. Step 1: Introduce the Box. 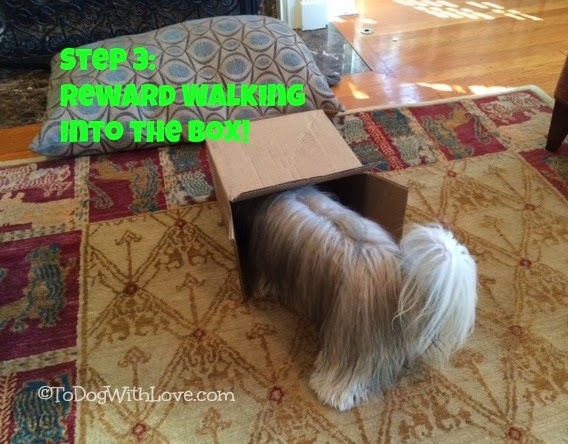 Step 2: Reward any behavior that leads toward entering the box. For example, click and treat a paw in the box. 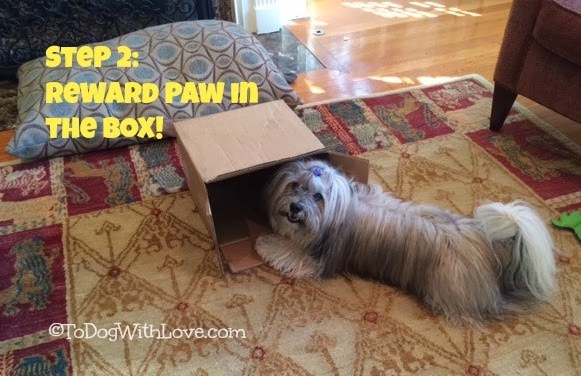 Step 3: Click and treat as your pup offers to go further into the box. Extra Credit: I used the back-back cue, which I've previously trained, to ask Rocco to squish further back in the box! After all, we're playing Hide and Seek! Here's what it looks like in action. I added the words "Go Hide" after Rocco was successfully entering the box on his own. We hope you enjoyed Go Hide! Next week we'll show you our progress on "Hide Your Eyes", inspired by the dog character Mr. Smith in The Awful Truth! How are your Hide and Seek games going? And, from now through February 21, FitDog Friday will co-locate with K9 Kamp. 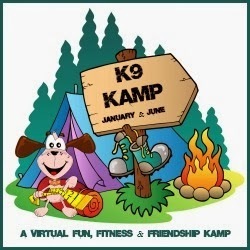 So we'd love for you to link up all your FitDog AND K9 Kamp posts here! And, don't forget to enter our K9 Kamp giveaway! You'll find it our FitDog Friday post from last week. We will give that a go this afternoon and with all the rain there is nowhere to walk in our park and we need some extra activity. Have a fabulous Friday. Boxes can provide lots of entertainment on a rainy day! Stay dry! Rocco really gets into that box! If it wasn't for his bushy tail, we wouldn't even know he is there! He folds himself in half! He's quite flexible! ha! Oh man, I love this trick! :) It's so very creative and fun! Now I just gotta find a box big enough for Niles to fit in. Cute, and fun idea! We might need some pretty big boxes, though at our house. Looks like Rocco is as happy as a cat in a box! Great job, Rocco! We've been playing hide and seek with the ball in our fresh snow this week! LOVE this and we will surely give it a try (just have to get a bog box). Golden Thanks for sharing. Happy Fit Dog Friday. Golden Woofs.